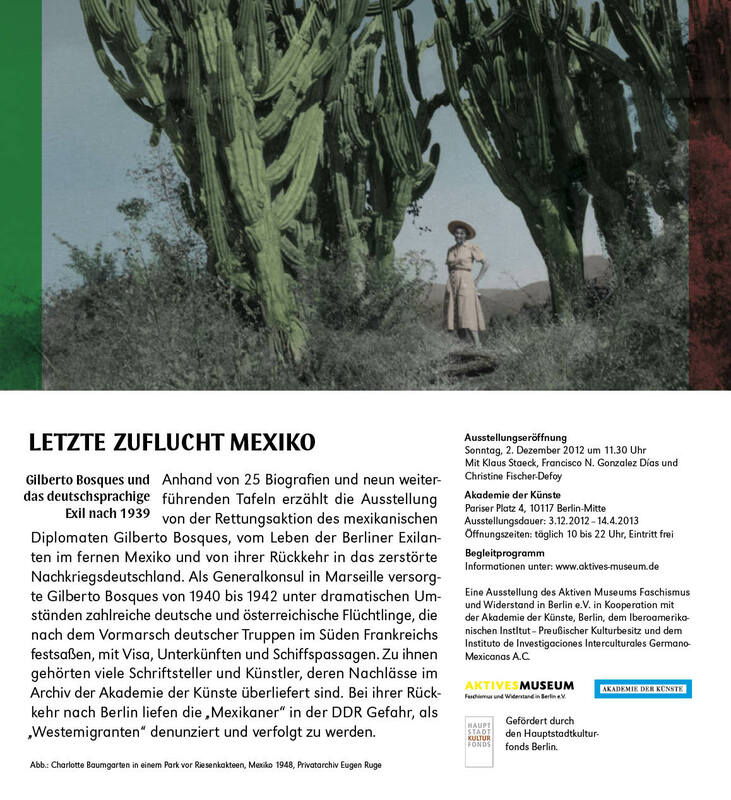 This exhibition, encompassing 25 biographies and nine explanatory panels, explores the rescue work performed by Mexican diplomat Gilberto Bosques, the life of the Berlin exiles in far-off Mexico, and their eventual return to the ruins of post-war Germany. As a consul in Marseille, Gilberto Bosques defied the circumstances to organize visas, accommodation and ships’ passages for many German and Austrian refugees trapped in the South of France following the advance of the German army. Among them were many writers and artists whose estates are held in the archive of the Akademie der Künste in Berlin. On their return to what was then East Berlin, this “Mexican group” faced a renewed risk of denunciation and persecution as they were deemed “Western immigrants” by the communist state. Subsequently on tour, showing at: Maison Heinrich Heine, Paris; university library, FernUniversität Hagen; union building, Wolfsburg; Eppertshausen Town Hall; Instituto Cervantes, Frankfurt am Main; Mexican embassy, Berlin; Alfred Toepfer Foundation, Hamburg; Kreuzberg Town Hall, Berlin. An exhibition catalogue (German-language) has been published in-house, which is available for purchase from the Aktives Museum office, priced €20 (postage not included). Simply contact the office by phone or email at info(at)aktives-museum.de. Faschismus und Widerstand in Berlin e.V.